Fastly allows you to change origin servers based on the user's geographic location. This is useful when you need to serve different content to users who are in different locations. For example, you could change origin servers to serve a restricted version of your website to users in a different country. 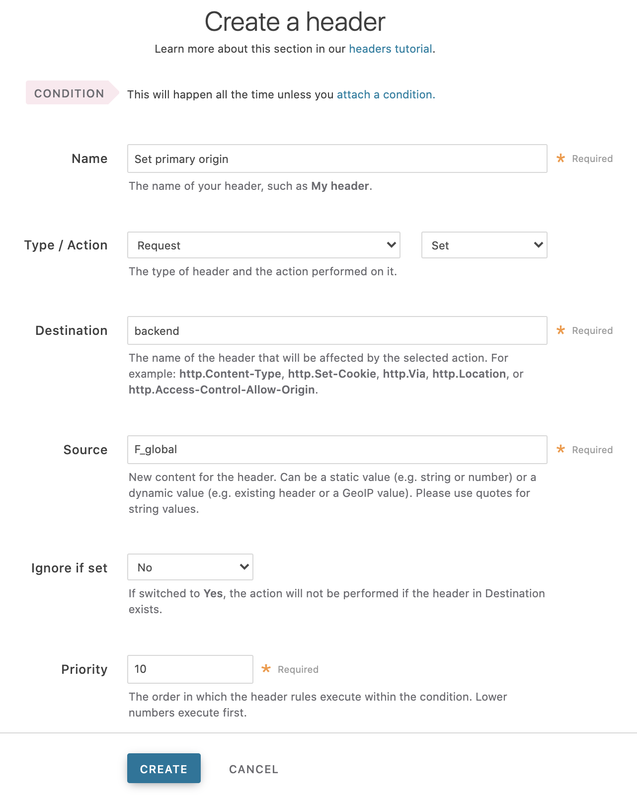 You can use the web interface to create the headers and the condition. In the Name field, type the name of your header rule (for example, Set default origin). From the Type menu, select Request, and from the Action menu, select Set. In the Destination field, type backend. In the Source field, type the name of origin server you want to serve content to the majority of users (here it's F_global). Preview the VCL to find the name of the origin server. In the Name field, type the name of your header rule (for example, Set restricted origin). In the Source field, type the name of restricted origin server you want to serve content to the users residing in the countries specified in the condition (here it's F_restricted_content). Preview the VCL to find the name of the origin server. In the Priority field, type 11. 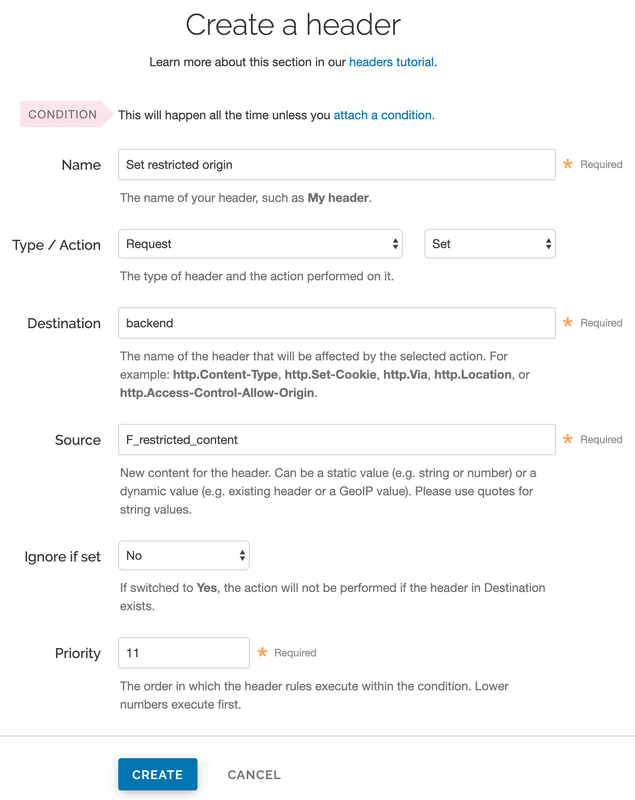 In the Headers section, click the Attach a condition link next to the Set restricted origin header. The Create a new request condition window appears. In the Name field, type a descriptive name for the new condition (for example, From Restricted Location). 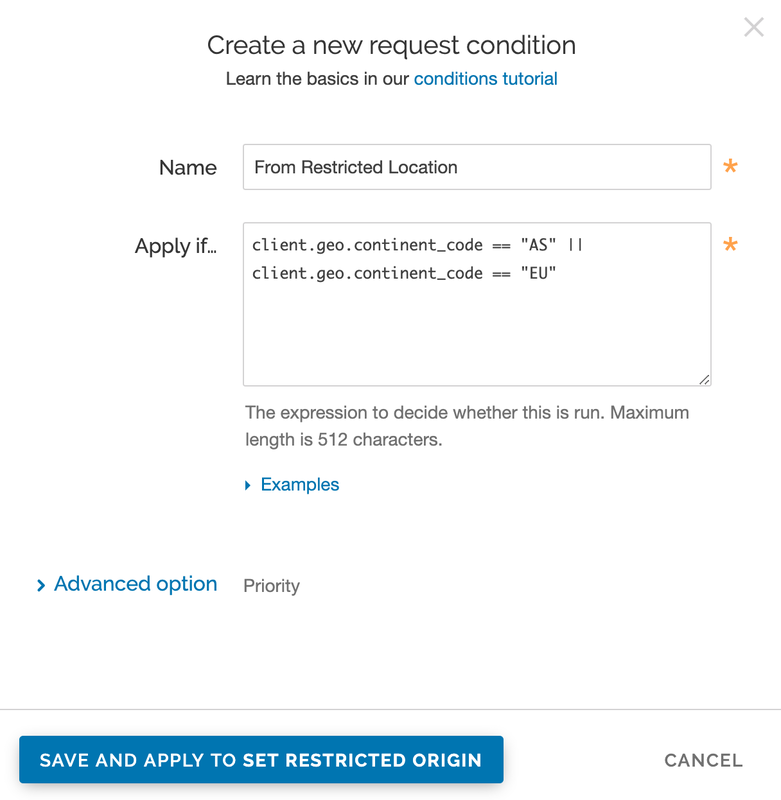 In the Apply if field, type a request condition. For example, to send all users in Asia and Europe to the restricted origin server, type client.geo.continent_code == "AS" || client.geo.continent_code == "EU". See Geolocation-related VCL features for more information. Click the Save and apply to button.